Journal of the Korean Society for Quality Management is an academic journal published by the Korean Society for Quality Management. This Journal aims to improve quality of Korean companies, and to encourage research activities of quality specialists and share the outcome. All contents related to quality suitable for this Journal can be contributed. Thesis Type Research papers, applied theses, case studies, literature reviews, etc. Regardless of the fields, to 10 pages, above cost is imposed and additional cost of KRW 30 thousand in each pages is imposed. Total pages can't be exceeded 20 pages, if, exceeding 20 pages, special cost is imposed. Article-processing Charge No article processing charge will be requested from authors outside of Korea in order to encourage active submission from throughout the world, particularly Asia and developing countries. This policy is subject to change in the future. Contributors of theses must follow the ethics guidelines for academic journal below. Author of Thesis Authors of the theses must be the ones who actually contributed to writing the theses. Prohibition of Double Contributions Contributed theses must be the ones that have not been published in other journals, and all or part of the theses contributed to this Journal must not be doubly published in any other publication. Prohibition of Plagiarism Concepts/data/figures used in the theses must be properly cited and clarify the sources. Plagiarism without approval is prohibited. Standard of Ethics Guidelines Authors of the theses must be responsible for the whole contents of the theses contributed. General ethics related to the theses must be followed according to publication ethics regulation (http://publicationethics.org/). Thesis Contributor to this Journal must submit the following. Manuscript of Thesis Contributed thesis must be in the format required by the Society. If not in proper format, it cannot be submitted. When publication is confirmed, abstract/figures/tables/references must be submitted in separate file. Figures and tables must be clear and comprehensible by anyone. Source data used in the thesis must be submitted when requested by examiner, and must be preserved for one year after publication. Experiments used in the thesis must be explained in detail for others to verify. The forms of theses that can be contributed to this Journal are as follows. Theses contributed to this Journal are peer-reviewed in the following procedure. Rule of Confidentiality All theses contributed are treated as confidential. Reviewer Editor in Chief requests representative editor in the specialized field of the contributed thesis to select three reviewers who can examine the thesis and requests them for examination as specialist. Thesis reviewers examine the requested thesis with fairness and impartiality within given time. Thesis contributor is made anonymous so that reviewers cannot identify. Editor in Chief monitors fairness and impartiality of reviewers, and when violated, withdraws immediately and selects other reviewers. Revision of thesis If reviewers request revision of manuscript, contributor must resubmit revised manuscript within given time. If revised thesis is not submitted for three months maximum, it is considered that contributor has no intention to submit and thus is rejected. 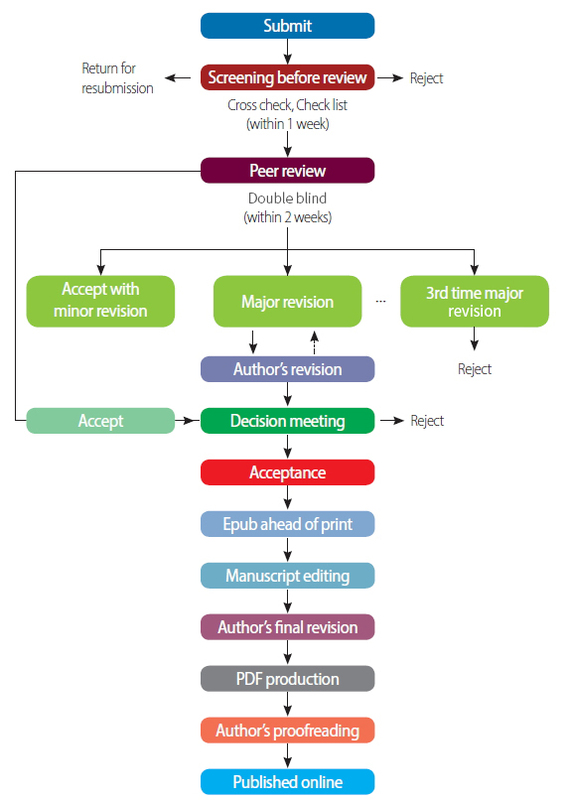 Determination of Publication Rejection and publication are determined according to the judgment of reviewers. Thesis Prohibited from Publication Rejected theses are prohibited from being submitted again. Theses refused by Editor in Chief due to code of ethics are prohibited from being submitted again. (1) For word processor, Hangul must be used. Manuscript title, author name and affiliation must be written in Korean (English when the name is English) and English. If there are multiple authors, the author listed first is the lead author, and the others are co-authors. Also, corresponding author must be indicated. When writing in English, the first letter of each word used in the title must be capitalized, and all last names in capital letters. Corresponding author must be indicated separately, with contact address, email, phone and fax numbers written at the bottom of the page in footnote. ① The text must start from introduction and end with conclusion, in the order of ‘1. Introduction’ and ‘2. Research Purpose’ using Arabic numerals. ② When dividing into smaller paragraphs, it must be written as ‘2.1 Research Background’ and ‘2.1.1 Necessity for Research’. Numbers over four steps such as ‘2.1.1.1 Examination in Theoretical Aspects’ must be avoided. ① Tables or Figures must have titles, and submitted in clean state that can be transcribed. ② The title of Table must be located above the table, written as ‘Table 1: 10 Dimensions for Service Quality’. 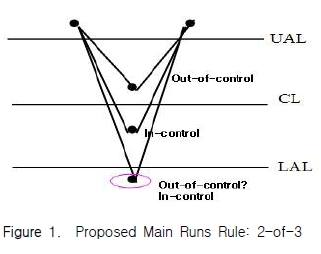 ③ The title of Figure must be located below the figure, written as ‘Figure 1: Deming’s PDCA Cycle’. Footnotes must be used when necessary, putting serial numbers on the upper-right corner of phrases, and recording contents of footnotes at the bottom of the relevant manuscript. For Korean manuscripts, academic terms are to be written in Korean if possible, and may have English terms written in brackets after the relevant terms to help understand the translated terms. Terms difficult to translate as well as human names, place names and proper nouns must be written in the original language. ① Formulas must be numbered on the rightmost using brackets such as ‘(1)’, and when cited again, i t must be written as ‘Formula (1)’ or ‘Equation (1)’. ② cgs or mks must be used as the unit. Contributors can clarify the contents of contribution and express words of acknowledgement for institutes or individuals that supported the research administratively, technologically or financially. References must be written in English. When translating Korean directly to English, the translation must follow Romanization Orthography prescribed by the National Institute of the Korean Language [Download Romanization Orthography of National Institute of the Korean Language]. References must follow the Chicago Citation Guidelines [Download Chicago Citation Guidelines]. References must be listed in alphabetical order. Kossinets, Gueorgi, and Duncan J. Watts. 2009. “Origins of Homophily in an Evolving Social Network.” American Journal of Sociology 115:405–50. Accessed February 28, 2010. doi:10.1086/ 599247. McDonald’s Corporation. 2008.“McDonald’s Happy Meal Toy Safety Facts.”Accessed July 19. http://www.mcdonalds.com/corp/about/factsheets.html. Citation of reference in the text must be written as follows. Contents necessary to explain the thesis can be added as an appendix. Furthermore, necessary contents advised by the reviewer can be added to the appendix. All authors or co-authors must write their main academic background, career, current job, and interests in less than 100 Korean characters. Author’s introduction must be submitted according to the request of Editor in Chief after confirmation of thesis publication. Purpose: This study analyzes 3 different national quality awards and compare with the result from Korean quality awards conducted by Ministry of knowledge and Economy and Korea institute for advancement of technology. Methods: We closely looked at each qualifications and tables of different countries’ awards and compared with one used in Korea. Finally we proposed some suggestions to use not only domestic model but also international ones to be objective and add efficiency to organizations. Results: Depend on similarity of qualifications and weights, there were countries with different results and these caused score and ranking changes. Nevertheless, there was a comparison that did not make any changes on both score and ranking. Conclusion: We recognized the limitation that a standardized quality variation cannot be enough sources to test with different size and criteria. Integrating global standards and flow would be the first step to help grow technoparks and organizations placed in Korea in days to come. Text must be written in Batang Font and 9.5pt. Abstract, tables, figures, and references must be in English. Text can be written in Korean. Figures and Tables must be numbered in the order of citation in the text. The title of the Table must be written at the center of the top without a period, and the description of the Figure must be written below and ended with a period. The title and content of the Figure and Table must capitalize only the first letter and a proper noun. Pollan, Michael. 2006. The Omnivore’s Dilemma: A Natural History of Four Meals. New York: Penguin. Ward, Geoffrey C., and Ken Burns. 2007. The War: An Intimate History, 1941–1945. New York: Knopf. Weinstein, Joshua I. 2009. “The Market in Plato’s Republic.” Classical Philology 104:439–58.